The Jasenovac Monument is devoted to the victims of the Ustasha genocide during World War II. It serves as a reminder of the atrocities perpetrated in the Jasenovac concentration camp. 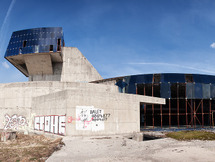 Designed by Bogdan Bogdanović and unveiled in 1966. The concrete flower represents the center of the wider spatial arrangement in the area of the former concentration camp, which is complemented by natural elements such as water and greenery. The area is flat, so the vertical of the monument represents a distinctive dominant, which is visible from afar. 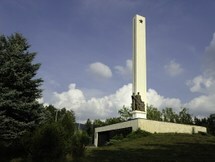 The monument itself is located on a green slope, the backdrop of which is made up of forest belts. In it's immediate vicinity there is a dynamic water surface, across which a wooden bridge leads us directly to the monument. The monument is placed on a slightly elevated terrain, so that the wooden path, which runs along the route of former railway rails - starting from the point where the wagon is exhibited, next to the road that leads to the museum - brings us to the open foot of the monument, and then lowers a level lower, actually under it and in its inside. The arrangement is completed by smaller natural land art elements in form of mounds and pits, which illustrate the sites and the arrangement of buildings in the former camp. In one of the phases of the development of the project, the author wanted to illustrate the composition of the objects with a series of smaller concrete flowers, which could have the exact opposite effect and undermine the central role of the main flower itself. The monument, 24 meters high and 35 meters wide, due to its sensibility, both in symbolism and in the composition in the existing context, is regarded as one of the key examples of the innovative approach to memorial sculpture and architecture in post-WWII Yugoslavia. The memorial plaques and clearly shaped plastic of human figures have largely been replaced by the abstract compositions, which interpreted a certain historical event in an unprecedented way. In this regard, the interaction between the monument as a feature and the marked space, or the place of the event, was of great importance. It is only by reaching the harmony between the existing natural landscape and the body located there that the visitor can achieve the internalization of the historical memory and anchoring it into his consciousness. In this case, this is especially noticeable, since the placement of the monument in an otherwise rather anonymous landscape gave the space a completely new, metaphysical dimension. The space that leads us to the monument is designed sequentially. Despite the fact that the monument itself is visible from afar, the path always gives us a new view of it, each one more dramatic than the previous, which reaches its peak at the foot. The space is in fact subordinate to the monument and designed to emphasize its magnificence and its centrality in the context of the narrower arrangement of the memorial complex as well as within the wider space and the natural landscape in which it is located. In itself, a romantic and even a cliché motive that gives us feelings of beauty and hope, in the context under consideration, is a metaphysical juncture of the past, the present and the future. The petals, which open towards the sky and form a kind of a crown of the monument, blend into a monolithic stem, which is re-expanded at the bottom of the organically shaped piedestal, which with it's shape resembles the roots, while balancing the entire structure. Vertical separation is completed by an underground ossuary, in which the remains of victims are preserved. These are the experiences of the past, rooted in the individual and collective consciousness of the present, blossoming along the stem and into the flowers of reconciliation, new life and a better future. In this regard, it is crucial that the monument remains undefined in it's symbolism and does not identify with any of the nationalities, religions and the like. Nevertheless, with it's image, it succeeds in observing the memory of the evil and the desire to reach a state of purity through catharsis. The melancholic restressed concrete lotus not only stops evil thoughts on each end, but it also has a certain catharic power. The monument in Jasenovac is much more than just a feature that today reminds us of the horrors that took place in this area during the Second World War. It is a symbol, full of mysticism, which relies on a historical memory, and uses it as a starting point for creating a vision of a better future.